Posted in English, English Language Quality Standards, Schools on December 9, 2014 by Shonali Ganguli. It was a day-long conference dedicated to raising standards of quality in education. 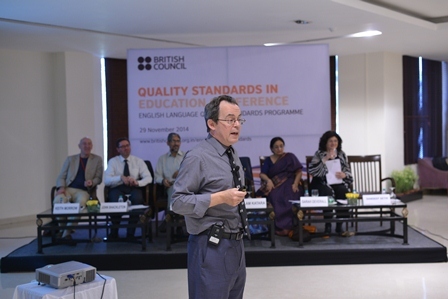 The speakers and audience — some of the best teachers, trainers, heads of schools and representatives from expert education bodies like NCERT, Quality Council of India, CBSE, IATEFL, AI-NET, NCTE, Accreditation UK and English UK — made it an unforgettable experience. Organised by the British Council as a part of a week-long series of programmes around schools, the Quality Standards in Education conference held in Delhi on 29 November aimed to advance the debate about quality standards in education, to look at current thinking and practice in relation to quality in schools and what currently is happening to ensure that quality. Presentations looked at the factors that can influence quality in the classroom: our teachers and the way they develop professionally; our examinations and attainment targets; the role that teacher associations play; we are particularly interested in discussing how professional associations for schools can be influential in supporting school development and in setting standards. They looked closely at the English Language Quality Standards Programme and the benefits it brings to participating schools. There were discussions around institutional capacity building and the importance of quality being embedded in a school’s systems. Experts from various organisations spoke about their experience in the area of quality in education and how they contributed to it. Discussions revolved around continuous professional development for teachers and forming associations for schools as a means to further quality. The audience participated enthusiastically and many interesting questions were posed to the speakers. An audience member passionately asked about what could be done to raise the profile of teaching as a profession to encourage more talented people to aspire to become teachers. Ashok Pandey, Principal, Ahlcon International School, while presenting a session on a roadmap for an Indian professional association for English medium schools, stressed on the importance of knowledge sharing among peers and said that only schools that share their knowledge and expertise can remain competitive in today’s day and age.